Planet Market Reports projects that the Marine Engines market size will grow from USD 11.65 Billion in 2017 to USD 14.66 Billion by 2023, at an estimated CAGR of 3.89%. The base year considered for the study is 2017, and the market size is projected from 2018 to 2023. The growth will be mainly driven by increased commercial vessels and rise in ship-building activity.Marine engines are used in various vessel types such as commercial vessels, offshore support vessels and other vessel types. 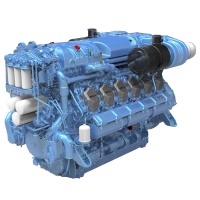 The report indicated that high demand for commercial vessels will drive the growth in the marine engines market. The report further sub-segments commercial vessels into bulkers, container ships, cargo vessels, LNG carriers, LPG carriers, pure car carriers, chemical carriers among other commercial vessel types. The high demand for commercial vessels will be bolstered by rise in maritime trade and increased world-wide demand for natural gas.